Lady Emily Hardcastle is an eccentric widow with a secret past. Florence Armstrong, her maid and confidante, is an expert in martial arts. The year is 1908 and they’ve just moved from London to the country, hoping for a quiet life.But it is not long before Lady Hardcastle is forced out of her self-imposed retirement. There’s a dead body in the woods, and the police are on the wrong scent. 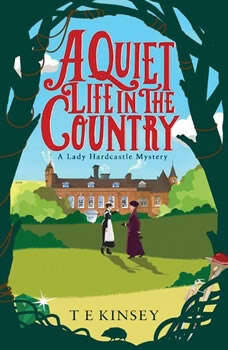 Lady Hardcastle makes some enquiries of her own, and it seems she knows a surprising amount about crime investigation…As Lady Hardcastle and Flo delve deeper into rural rivalries and resentment, they uncover a web of intrigue that extends far beyond the village. With almost no one free from suspicion, they can be certain of only one fact: there is no such thing as a quiet life in the country.